In most cases, incompletely condensed tri-silanol-phenyl-polyhedral oligomeric silsesquioxane (SSOH) was used as an intermediate to synthesize the polyhedral oligomeric silsesquioxane (POSS) with special structure. 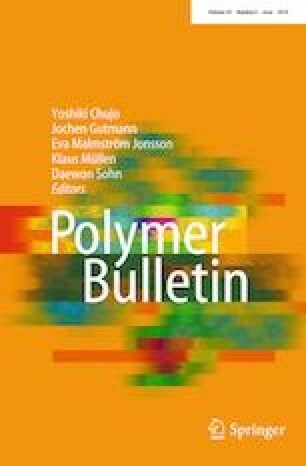 In this paper, SSOH was well synthesized and then immediately incorporated into hydroxyl-terminated polydimethylsiloxane (PDMS) as a co-cross-linking agent to prepare room-temperature-vulcanized (RTV) silicone rubber (SSOH-PDMS). Thermogravimetric analysis (TGA) results showed that the chemical incorporation of POSS into PDMS networks exerted significant enhancement of thermal stability for the rubber nanocomposites. For SSOH-PDMS with 5 wt% SSOH, the degradation temperature of 5% weight loss were delayed from 364.78 to 379.50 °C, while the temperature for 30% weight loss were increased by 47.4 °C. By monitoring the degradation behavior by TGA coupled with Fourier transform infrared spectroscopy (FTIR), the degradation mechanism of the modified RTV silicone rubber containing different concentration of the cross-linker SSOH has been investigated. The results showed that the SSOH greatly influenced the degradation mechanism of PDMS rubber in two ways: ① The reaction with the silanols in PDMS can diminish the degradation initiated by hydroxyl-terminal during the first degradation stage; ② the nanoreinforcement effect of POSS on the PDMS can delay the temperatures of the second thermal degradation stage. The authors acknowledge the support from funding provided by the National Natural Science Foundation of China (Grant No. 51073097).